Note: I pay for my Birchbox subscription, but I am a Birchbox affiliate and their links are in my posts. I was on vacation in June when all of my sub boxes arrived, and forgot to write up reviews of them! So if you are a subscriber, sorry, I am kind of slamming you tonight with all of these posts, but I wanted to get them up before the July boxes arrive! I think Birchbox is one of the highest value boxes, even though it's small. A lot of people have complaints because they only get deluxe samples and never get full-size, but the samples are always pretty high-end stuff, and the box only costs $10 a month, with a discount if you sign up for a year at a time. You also have the opportunity to get points you can use as store credit if you do reviews of your products, so you can usually get about $5 or more back a month. In this month's box, I loved the Davines Love Smoothing Shampoo. I think it was my favorite thing from the box. I really like Benefit They're Real as well. 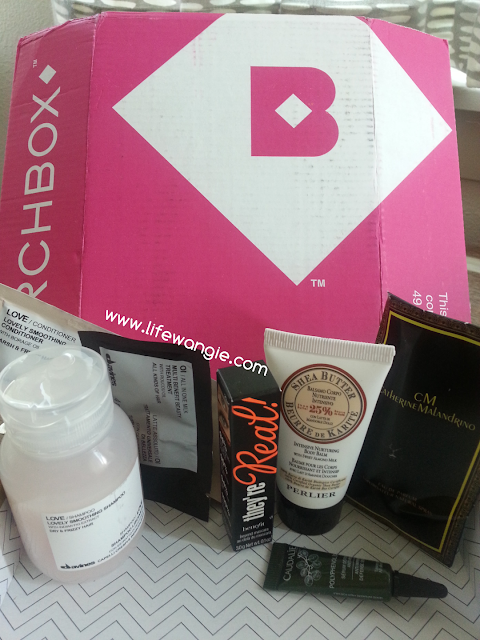 The other products were great quality as well, as I have come to expect from Birchbox. The body cream is really thick and smooth. I haven't tried the fragrance or the serum yet, but I am excited to try them!